I’d say I have quite a bit of volunteering experience, having lived in a centre for street children in Malawi for seven months, and then three months in India doing community projects in Tamil Nadu. Yet I have never been able to master the art of standing in front of a classroom full of children, with different age ranges, levels of English and practically no resources (never mind some of the children had never even been in a classroom before!) Most of the time I’d feel quite useless, never really quite telling if I’d actually taught anything well or if they understood what I was saying. Even after previous training with both organisations I went with, it still couldn’t help me once my nerves kicked in or when I was actually face to face with a group. Last summer, while in India, I’d actually gone out and bought the only white board I could find, just to help have some sort of visuals while teaching. It was too big, rolled up every few minutes and I had nothing to connect the actual white board to the wall. The books in the classroom were too advanced and even we English volunteers couldn’t understand them. And even though this was my second try at volunteering, I just didn’t understand how other volunteers worked around it. Well, this wasn’t actually the case. I found that every other volunteer I talked to had the same problem. They too found it overwhelming and just found it so hard to really make a difference, when we couldn’t even communicate with the people we were teaching because of language barriers – we’re not superheroes and each project and place has their own challenges. So I started brainstorming, sketching ideas and speaking to my parents on the phone as they did research over the internet back at home. Then… we came up with TripKits. Lightweight packs, they provide basic resources to support the volunteer while they’re face to face with the class. They have flashcards, counters, dice, an activity book with lots of ideas and games, and most importantly, a white board! 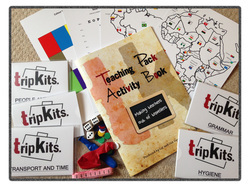 So now we’re set, we just need to let volunteers and travellers alike know about our packs so that not only the person teaching can have the support they need, but in turn they are supporting the people they are teaching. The Thai of my life! One afternoon, I decided it was time to wake up from my day dreams and turn them into a reality. Having no previous travel experience whatsoever, I was excited yet petrified! I dropped everything and jetted off half way around the world to embark on my travelling adventures. I didn’t have much of a plan and at the time, volunteering certainly wasn’t on my list of things to do however, they say the best things are the unplanned and oh boy are they right! Completing a tour of the Hill Tribes in Northern Thailand, I was then left with some ‘spare time’. “Why don’t you teach English at a School in the North East? I know a school in Nang Rong, Buriram who need help” said the tour leader. I responded with, “Teach English…me!” I didn’t even have any teaching qualifications! However, the tour leader urged me to check it out. He knew a ‘friend of a friend’ who worked at the school and promised that I wouldn’t need any certificates to teach, the school are just grateful for international visitors and especially those who are English nationals. Being a boarding school for orphaned and or mistreated children (aged 7-18yrs old) they are grateful to have the visitors to mingle and ‘talk’ to the children and to be able to give them the opportunity to practice their English. With the school only affording a few teachers, the English department is the worst suffering of all the subjects with only a few English teachers. It sounded like a very poor school who were doing all they could to look after these children as well as give them just as good an opportunity as any other learning child out there to prepare themselves for life. I became increasingly curious to see what this school was like so with that, the tour leader made some calls. I got myself a Thai sim card and had several conversations on the phone with the Head of the English department and another one of the English teachers there. They just wanted to know how good my English was, how well I did in school and of course, if I’d had any experience of teaching at all. With zilch experience, they were still more than happy to have me on board. I was off to join the School in Buriram! I negotiated free accommodation and free meals for my assistance. Once I arrived, I was warmly greeted by one of the other teachers and immediately shown to the guest house based on the schools site. It was basic accommodation but that didn’t matter to me…I had a 3 bedroom house all to myself! In the morning of my first day, I was greeted (or should I say mobbed) by happy, smiling children who looked so happy and excited to see me. I was then walked over to the schools assembly where I asked to introduce myself to 750 children! It was apparent that their English is not the best but I learnt to put together lesson plans including learning the Alphabet, phonics, English customs and culture, English food, weather etc the whole package! The children’s favourite part of the lesson was the sing song! I would teach them a catchy song and get them all to sing along! Sometimes I would even hear some of the children singing my songs under a tree in the playground! I even took it upon myself to make use of my recruitment skills (as that is what I do when working for a living back in the UK). With the help of a translator, I put together a ‘Route to Recruit’ scheme for the 18yr olds, just something to help prepare them for the world of work. Ups for me would be seeing the children’s faces! Such grateful, warm children who are just happy to be alive, safe and well. The teachers too are so hard working and do all they can to help the children and however they can. Another time really stands out for me too – the day the dance teachers dressed me up as a Thai girl! I loved it, I mean, what girl doesn’t like dress up hey! And the downers, I would have to say it did upset me to learn about some of the children’s backgrounds! It’s so sad to hear some of their stories and to see their sweet faces you do find yourself thinking ‘how can anyone hurt these wonderful little people’! But then again, they are all safe and at the school now and have bright futures ahead of them. In turn, it did make me miss my family back home but made me ever the more grateful that I have a loving family too. If you wish to read more about my time volunteering at the School or have any questions, please feel free to visit Through Helen Highwater and contact me there. If you are reading this blog, the chances are that you are interested in volunteering in another country. Overseas volunteering is something with a broad appeal, from students taking a gap year, to professionals looking for a career change, to retirees looking to offer their skills. In fact it is an activity that many people have on their bucket list of ‘things to do before they die’. There are a few reasons for this. Maybe it seems to offer a more authentic travel experience, off the well-worn tourist trails; an opportunity to connect and exchange with local people. Or it can be a way to give back to the communities that have provided us with such fond memories. It also offers a way to help and make a difference in the places we travel to, especially ones with seemingly such stark needs. However, ensuring that we offer our time to the right place in the right way is not as easy as it sounds. As the numbers of travelers looking to volunteer has grown, so too has the number of service providers offering volunteer experiences. Sometimes motivated by a profit or status-building incentive, there are examples of volunteer placements that end up being surface level experiences created purely for travelers to feel good about themselves. Or even worse, the good intentions of tourists and volunteers can be taken advantage of by corrupt organizations or unscrupulous individuals who may even harm or exploit those the project purports to help. These may not be the first thoughts on your mind as you are searching through websites looking for your way to contribute to the world! The reality is that volunteer travel offerings are as diverse and varied as a two-week holiday on the beaches of Bali and a year with a development agency in South Sudan. While those two extremes are easy to distinguish from their location and party appeal, many volunteer travel offerings in the exact same location can be structured in ways that make the offering educational and empowering for all involved or, at the opposite end of the spectrum, result in more harm than good. The trouble is, it’s really hard for potential volunteers to tell the difference between the two without looking beyond the surface level marketing. But don’t give up just yet! Learning Service is on the case with a toolkit of tips and tools of how to ensure that our volunteer choices are responsible. We are an education and advocacy group aiming to help people improve and rethink volunteer travel. We are launching a mini-video series with tips and tools for responsible global volunteering. To launch the campaign, they are also launching a competition with the chance to win some great prizes. Just watch the videos and answer a simple question! We would love for you to watch and share the videos, enter the competition, and join the global conversation. For more information, follow the Learning Service team on Facebook and Twitter, or reach out via contact@learningservice.info. In March 2013, my class of 16 students embarked on a 3 week long trip which would completely alter our views of the world. While our friends were vacationing at resorts in Mexico for spring break, we were looking past the touristy aspect of Central America, digging deep into the culture of Nicaragua. The course is a very special class for 16 and 17 year olds at West Vancouver Secondary School in British Columbia, Canada which gives students a unique opportunity. It allows motivated students with a passion for learning about the world and a desire to help those in need a chance to put their passion to use beyond the border. In preparation for our voyage we held multiple fundraisers around the community to help us fund our volunteer projects. Rather than restarting and abandoning projects each year, the 10 years which the class has been running has allowed the participants to focus on benefiting a specific community, transforming it further each year. Throughout the years, students have taken part in various projects around the small community of Balgue. One year, this included installing washing pilas (sinks) at the homes of some of Balgue’s residents. Another year, students joined another organization to take part in building and supplying books for a library at the elementary school. Each year, along with conducting their annual project, students spend some time volunteering at the town’s community centre. Since we first began volunteering there, the work of our class as well as various other volunteer groups has transformed the centre from a simple structure to the town’s central place. It is now equipped with a playground, a building for a sewing co-operative, a computer room, and a kitchen which runs a breakfast program for the children of the town. Each year’s actions have benefited Balgue in a unique way and this year, we conducted a very special project. After observing the very few musical instruments which the residents had access to in Balgue, last year’s participants proposed that we carry out their project: “Guitars for Balgue”. After spreading the word, Gibson’s Guitars (a local business) generously donated 10 guitars to us. We brought down the 10 guitars to Nicaragua and left them at the community centre in Balgue. We then used some of our fundraised money to hire a guitar teacher who would teach guitar lessons there. The project was a huge success and the people living in the community were extremely excited at the prospect of being able to learn guitar. As we spent three weeks in Nicaragua, we had a lot of time to partake in many different opportunities to volunteer. On the Island of Ometepe, we spent many laborious hours volunteering as we helped to build a road. 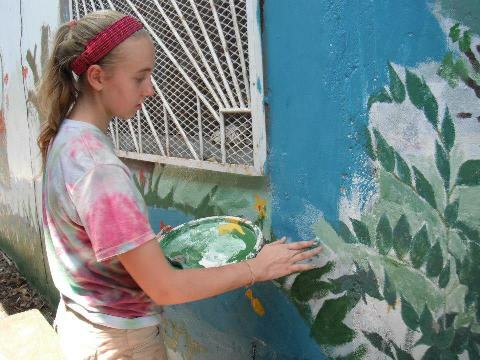 At the community centre, we constructed a composting system and painted a pretty mural onto the walls of the centre. Our class also visited a permaculture farm called Finca Bonafide which helps local farmers use sustainable forms of farming. It is a farm run by foreign volunteers and it was very cool to see such passionate young individuals trying to aid Nicaraguan farmers. We spent 5 days there, learning about the practice of permaculture as well as doing various jobs around the farm. Throughout our trip we stayed in several places such as Managua, Grenada, and Ometepe. As well as the volunteering aspect of the trip, the class aimed for us to gain a better perspective of the world. The 7 nights which we spent on Ometepe in a town called Balgue were undoubtedly the most memorable part of the trip which impacted me the most. For this week we were living with homestay families. Each student created a special bond with their homestays and even since I returned home, I think about my homestay family often. The families which we were placed with were average Nicaraguan families who lived off of a mere $2 a day. Our homestay family was an amazing family whose generosity and kindness towards us was incredible. The home was very small and our beds were surrounded by dusty brick walls and a tin roof. The week was a taste of the true Nicaraguan lifestyle and we came out of the experience with an incredible amount respect for our hardworking homestay families. The time spent with our homestays made me come to the realization that many of my preconceived about Nicaragua were incorrect. Living in a first world country, many people expect that those with less than us will feel envious of our privileges. In such a materialistic society, it is difficult for us to grasp the concept that some of the happiest people in the world are also the poorest. When I first arrived at homestays I found myself feeling surprised when I saw how happy the family was with the way that they were living. Our homestay mother told us one night that while they would love to have more money to put towards food, medicine, education, and fixing their home, they really didn’t need anything fancy or non-essential. They were happy with their way of life and although they were aware of more wealthy people around the world, that was not something which was constantly on their minds. After returning home, I constantly find myself questioning what is really important in life. I have realized that possessions are nowhere near as important as many intangible aspects of life. At many moments, our homestay family’s sparse possessions prompted me to think of my own home and all of the unnecessary clutter which I had accumulated. It disgusted me to think of how much money I spent on things I didn’t really need while families around the world were deprived of the bare minimum. Reflecting on my trip, the experience was truly life-changing and I never would have anticipated that it would teach me so much. Nicaragua is an incredibly beautiful country and the people there were so kind and appreciative of our actions. I really hope that I will have the opportunity to return to Nicaragua one day in the near future. Lucy Mavko is a student at West Vancouver Secondary School in British Columbia, Canada. Lima is not everybody’s favourite city, and this 12-hour tourist train to the altiplano town of Huancayo provides the perfect getaway. Taking you through the heart of the Andes, Peru’s Central Railway route is 15,689 feet above sea level at its peak, the second-highest in the world. This route provides a breath-taking slalom through snow-tipped mountains, sun-bleached countryside and clear blue skies. For a £25 one-way ticket, you can enjoy the view through panoramic windows and skylights, with a reclining seat, local dinner and pisco cocktail all included. The 206-mile journey includes high-alpine lagoons, elongated tunnels and the most wonderfully charming, old-fashioned bridges. The classic Inca Trail is usually very busy and you will need to share your journey with many other travellers. An Inca Trail community trek will allow you to combine sightseeing with community help, perfect for budding volunteers. Here you can stay with local families, learn their culture and help villagers with crop planting or schooling. The Peruvian locals are extremely hard working, polite and eager to share their culture with visitors. You can sample local delicacies, like Lomo Saltado, Ceviche Mixto, or even ask for ‘cuy’, roasted Guinea Pig meat served on a spit – juicy and tender but not for the faint hearted. Peru is well known for its beautiful beaches and many are familiar with its popular surfing culture. The most popular surfing spots include Herradura, Costa Verde, and Punta Rocas south of Lima. Punta Sal is also really popular, with crystal clear water, pure white sands and excellent waves. At Huanchaco, close to the ruins of Chan Chan, you can also watch fishermen perform an ancient surfing tradition, where they stand up in reed boats called ‘caballitos de totora’. This beautiful ‘White City’ is located immediately below the Misti Volcano, providing the most breath taking view on a clear day. El Misti is hard work to climb and you will need plenty of energy and a decent ice axe; it’s also best to climb between July and November, with the later months being warmer. Santa Catalina Monastery is a wonderful white and blue building which perfectly matches the beautiful backdrop beyond it. Majes River Lodge also offers three-hour rafting trips that pass through class IV rapids on the Rio Majes; these are not for those of a nervous disposition. Iquitos is the world’s largest city that is unreachable by road, located on the left bank of the Amazon River and surrounded by rainforest. Travellers usually come to the city for an excursion or Amazon riverboat trip, but you should certainly stay a few days. With thousands of motorcycles and three-wheeler ‘moto-kars’ weaving through traffic, the town has a unique atmosphere which is both charming and slightly manic at the same time. Be sure to visit the Museo Amazonico, a museum which contains the sculptures by Felipe Lettersten. You can also watch the sun rise over the from the Malecon, this is really beautiful. Belen is the Venice of the Amazon, with houses built on balsa rafts which float on the river.